I am presiding at the Community Eucharist in the chapel of the Church of Ireland Theological Institute this evening [27 January], and the Revd Dr William Olhausen is the preacher. We are using the Readings, Collect and Post-Communion Prayer of the Third Sunday after the Epiphany: Nehemiah 8: 1-3, 5-6, 8-10; Psalm 19; I Corinthians 12: 12-31a; and Luke 4: 14-21. The booklet prepared for this evening includes two illustrations of the Gospel reading. 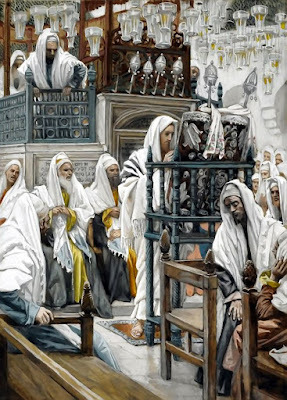 The cover image of ‘Jesus rejected in the Synagogue’ is a painting by the French artist James Tissot (1836-1902). He was born Jacques Joseph Tissot in Nantes on 15 October 1836 but he Anglicised his name while he was still in his teens. He was a successful painter of Paris society before moving to London in 1871. He became famous as a genre painter of fashionably dressed women shown in various scenes of everyday life. He also painted scenes and characters from the Bible. Tissot’s mother, Marie Durand, was a devout Catholic who instilled pious devotion in her son at a very young age. In 1856 or 1857, he moved to study in Paris where he stayed with his mother’s friend, the painter Elie Delaunay. There too he got to know the American painter James McNeill Whistler and the French painters Edgar Degas and Édouard Manet. He took part in the Franco-Prussian War as part of the Paris Commune in the defence of Paris. Perhaps because of these radical political associations, he left Paris in 1871 for London, where he worked as a caricaturist for Vanity Fair and exhibited at the Royal Academy. In London, he lived in Grove End Road in Saint John's Wood, an area then popular with artists, and his work was snatched up by wealthy British industrialists. Around 1875 or 1876, Tissot met Kathleen Newton, a divorcee who became his companion, his frequent model, his muse and the love of his life. Kathleen ‘Kate’ Newton (1854-1882) was born Kathleen Irene Ashburnham Kelly into an Irish Catholic medical family: her father, Charles Frederick Ashburnham Kelly, was an Irish army officer who was employed by the East India Company in Lahore; her mother, Flora Boyd, was also from Ireland. Kathleen was raised in Agra and Lahore in India, and when she was 16 she married Isaac Newton, a surgeon with the Indian Civil Service, in January 1870. But even before their marriage was consummated, Newton began divorce proceedings, alleging she had an affair on the passage to India with a Captain Palliser, who never actually seduced her. Her jealous husband sent her back to England. In London she met Tissot, and when she was 23 she posed in 1877 for his painting ‘Mavourneen,’ a title inspired by a term of endearment derived from the Irish mo mhuirnín (“my dear one”), and possibly a reference to ‘Kathleen Mavourneen,’ a popular song and play first staged in London in 1876. Tissot was fascinated by the conflict of her Irish Catholic background, her divorce and her status as the unmarried mother of two children. She moved into his house in 1876, and they had a son, Cecil George Newton Ashburnham. Tissot described their life together as ‘domestic bliss,’ and she lived with him until her death in November 1882. When she was diagnosed with tuberculosis, she feared she would be a burden on Tissot and overdosed on Laudanum. When she died, a grieving Tissot sat by her coffin for four days. 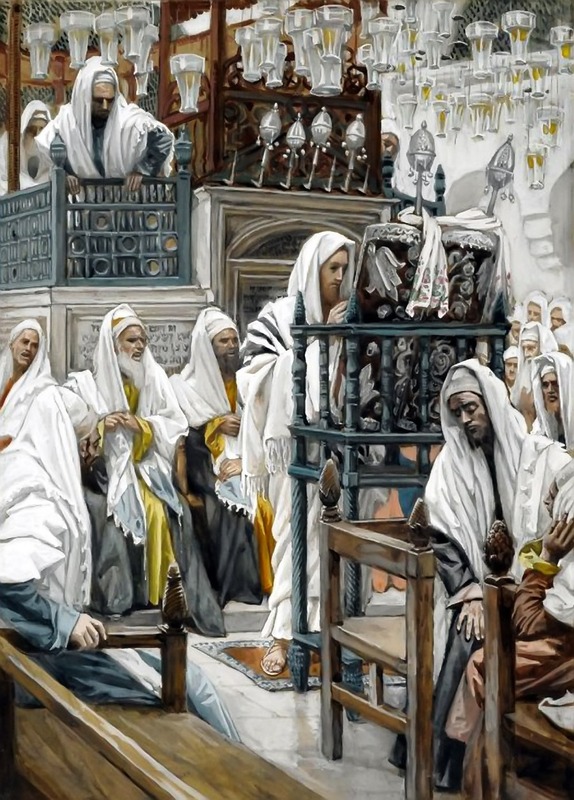 After Kathleen’s death, Tissot returned to Paris, and a revival of his Catholic faith in 1885 led him to spend the rest of his life painting Biblical scenes and events, and this evening’s cover painting was completed in 1894. To help his completion of biblical scenes, he travelled to the Middle East in 1886, 1889 and 1896 to study the landscape and the people. His series of 365 illustrations of the life of Christ were shown to critical acclaim and enthusiastic audiences in Paris (1894-1895), London (1896) and New York (1898-1899), before being bought by the Brooklyn Museum in 1900. He spent his last years working on paintings of Old Testament subjects and themes. He died on 8 August 1902. 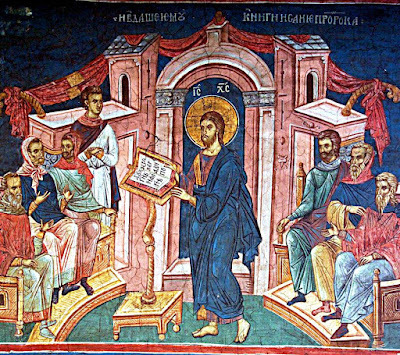 The back cover of this evening’s brochure is illustrated with a 14th century fresco of Christ preaching in the synagogue from the Serbian Orthodox Monastery of Visoki Decani in Kosovo. The church has a five-nave naos, a three-part iconostasis, and a three-nave parvise. The portals, windows, consoles and capitals are richly decorated. Christ the Judge is shown surrounded by angels in the western part of the Church. Its 20 major cycles of fresco murals represent the largest preserved gallery of Serbian mediaeval art, featuring over 1,000 compositions and several thousand portraits. This evening’s readings, collect and post-communion prayer are those for last Sunday, the Third Sunday after the Epiphany. Two of our hymns this evening are from the new supplemental hymnal, Thanks & Praise. Processional Hymn: ‘O worship the Lord in the beauty of holiness’ (Church Hymnal, 196) by John SB Maunsell (1811-1875), who was born in Derry, the son of Archdeacon Thomas Bewley Monsell. He served in the dioceses of Derry and Connor for almost 20 years before moving to England, and built or rebuilt three churches. He died when he fell from the roof of Saint Nicholas’s Church, Guildford, while it was being rebuilt. This hymn is based on Psalm 96 and I Chronicles 16. It was written as an Epiphany hymn, but is also popular as a processional hymn. Gradual:‘Rise and hear! The Lord is speaking’ (Church Hymnal, 385) is by Canon Howard Gaunt (1902-1983), a school headmaster and hymn writer who also played county cricket for Warwickshire. The tune ‘Sussex’ by Ralph Vaughan Williams is better known as the setting for ‘Father, hear the prayer we offer’ (Church Hymnal, 645). Offertory: ‘The feast is ready’ (Church Hymnal, 448) was written by Graham Kendrick for the musical event ‘Make Way for the Cross.’ The music is arranged by Christopher Norton, the composer of the ‘Microjazz’ series, and Alison Cadden, who has been organist of Lisburn Cathedral and Shankill Parish Church, Lurgan. Post Communion Hymn: ‘Go at the call of God’ (Thanks & Praise, 42) is by Canon Rosalind Brown was first published in Being a Priest Today (2002), which she co-wrote with Bishop Christopher Cocksworth. She is a Residentiary Canon and Canon Librarian of Durham Cathedral, and a weekly columnist in the Church Times. The tune Diademata by Sir George Job Elvey (1816-1893), was originally written for ‘Crown him with many crowns’ (Church Hymnal, 263) by Matthew Bridges and Godfrey Thring.